When I shared the recipe for Mom’s Brodo several weeks ago, it was with today’s post in mind. While it may be true that her broth was used in a number of recipes, from chicken cacciatore to risotto, for many of us, it was at its best when served with Cappelletti, yet another jewel in the Bartolini Crown of Recipes. Traditionally served at Christmastime, cappelletti are a type of stuffed pasta said to resemble small hats. Search the internet and you’ll see them made much like the making of tortellini. I’ve watched cooking shows touring Bologna and have been mesmerized at the sight of women quickly fashioning cappelletti by hand. As the camera moves back offering a wider shot, it is really quite impressive to see all the freshly made little hats prepared that morning. That is not what you’re going to see here today. Forming those little hats is a most time-consuming practice unless you’ve enough experience to become proficient. The women I’ve watched will make more cappelletti in one day than a Bartolini would have made all year — and then some. There is just no way Mom or Zia could devote the time to make enough little hats to serve their families later that day. You read that right, later that day. When I was a boy, few families, if any, owned freezers other than the small compartment atop their refrigerator. As a result, there simply was no place to store freshly made ravioli or cappelletti. This meant that Mom and Zia got to work making pasta at 5:00 AM on every holiday. As such, either ravioli or cappelletti were made on any given holiday and never both. So, in our home, Mom served ravioli for our Christmas Day dinner, while cappelletti was served for lunch on New Year’s Day. There were days, however, when the cappelletti lunch was nixed in favor ravioli that night. It wasn’t until a large freezer was bought and placed in the basement that it became possible for ravioli and cappelletti to be made ahead of the actual holiday — allowing Mom and Zia to get some much-needed rest on those holiday mornings. Not only that, but it, also, became possible to have cappelletti for lunch AND ravioli for dinner on the same holiday. What joy! Yet, even though they could now prepare their pasta in advance, there was still no way that either Sister could afford the time to make little hats. Initially, they made cappelletti as they did ravioli, rolling out large sheets of dough, covering half will little balls of filling, and then covering them with the “free” half of the dough sheet. Using a spoon handle, the mound in the dough were sealed and then cut using a pastry wheel. Remember that cappelletti are served in soup and shouldn’t need to be cut before being eaten. Each must be small enough to fit comfortably on a soup spoon, making this a time-consuming process in its own right. There was — and is — no need for hats. Speaking of which and just to be clear, although we call our pasta cappelletti, they actually are small ravioli, raviolini. Everything changed again when Mom started using dies (moulds) to make her ravioli and cappelletti. Her cappelletti became miniaturized, smaller than any she’d made before. I have that die and, unfortunately, I’ve yet to be able to master it. The compartments for the filling are far too small for my hands to fill. I never saw Mom use the die and I must be missing some secret trick to its use. Now, Mom’s die made 40 cappelletti, each ¾ inch (1.9 cm) square, while my die will make 48 cappelletti, each 1 inch (2.5 cm) square. That ¼ inch may not seem like a lot but it’s enough to separate success from failure on my pasta board. Even so, I know that I’m not done trying to learn how to use that die if for no other reason than self-satisfaction. This post will not be as detailed as previous posts when depicting the use of a ravioli die. 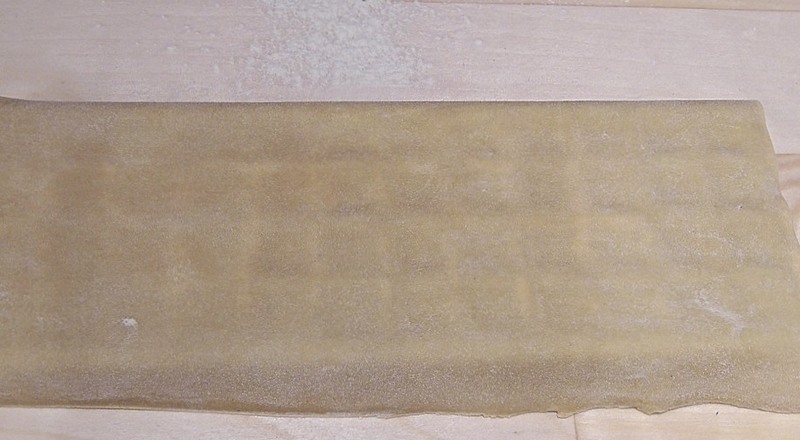 You can find more complete instructions in my Ravioli dei Bartolini post. No matter the size of the die or the resulting pasta, the steps required are the same. 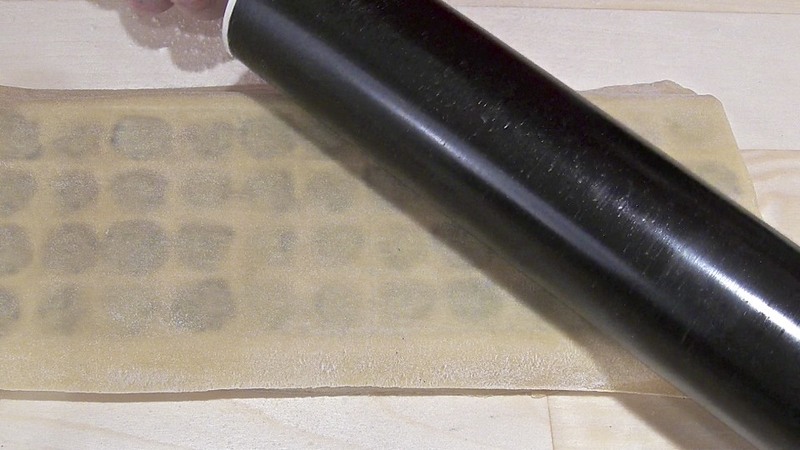 Cover the die with a sheet of dough; place a small amount of filling in each indentation; lightly moisten another dough sheet before placing it atop the first; use a rolling-pin to seal the 2 sheets; remove the now-joined sheets from the die; and, separate the individual raviolo. Sometimes, a pastry wheel will be required to cut and separate them. When using any die, the most important thing to remember is not to overstuff each compartment. Look again at the 2 dies in the photo above. One has compartments that are open while the other’s compartments have a back and are closed. When using a die that is open, the dough sheet will stretch a little to compensate if you’ve used too much filling. Even so, use too much filling and the dough sheet will stretch to the point of tearing, a very disheartening sight. If you place too much filling on to a die that is closed, that has a back, the excess filling has nowhere to go other than out that compartment’s sides, possibly affecting the seal of not just that one raviolo but all of its neighbors, as well. 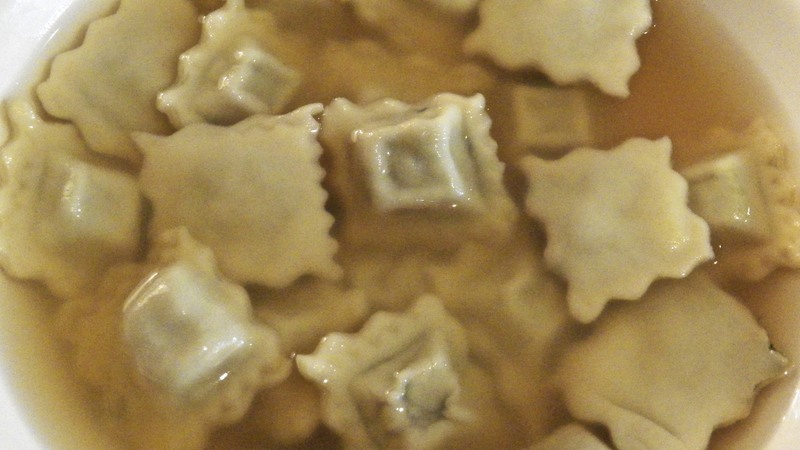 All is not lost, though, for some of these poorly sealed ravioli. Ravioli are first boiled in water before being drained and dressed with your favorite sauce. 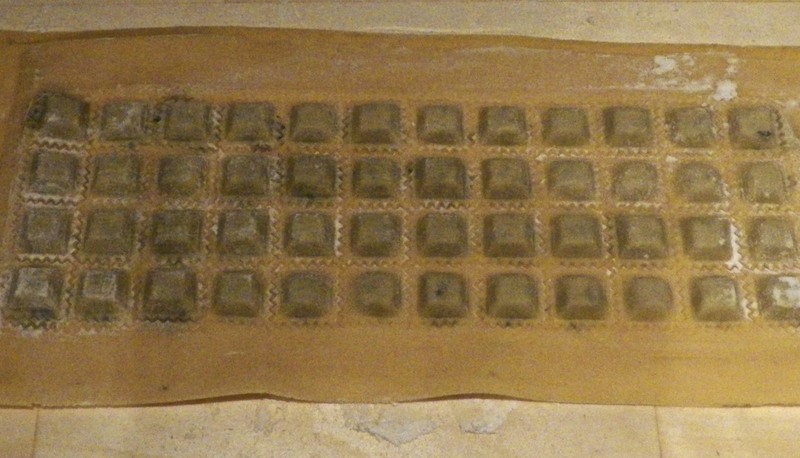 Poorly sealed ravioli will dump their contents during the boiling or draining stage. Little can be done to save them and their tasty filling. Cappelletti, though, are a different matter altogether. As you’ll soon see, these are cooked in brodo and should any split during cooking, the contents aren’t lost but will serve to flavor the soup. It may not be pretty but it will be one tasty bowl of soup. The recipe for the cappelletti filling is easy to follow and lacks exotic ingredients, a hallmark of Bartolini recipes. It can be made as much as 2 days in advance so long as it is kept covered and refrigerated. Longer than that, it may be frozen and used within a few weeks. In preparation for this post, I made about 500 cappelletti with one batch of filling — and still had enough filling left over to use in another recipe. That dish will be shared sometime in the weeks ahead. Once the filling has rested, you can begin making your cappelletti. Our cappelletti are served alone in brodo. Adding other ingredients, aside from a garnish of grated cheese, might serve to overpower the hint of nutmeg or touch of lemon zest flavors within the cappelletti. My blogging buddy, Stefan, serves his tasty Tortellini in Brodo the same way. Ours is not the only way, however. Recipes abound that feature tortellini served in brodo with a variety of ingredients. Last October, my friend Linda, of Savoring Every Bite, shared her tasty recipe for one such preparation, a hearty Tortellini Soup. And, not to be outdone, my friend Tanya, over at Chica Andaluza, just last week posted her delicious recipe featuring Tortellini with Leeks and Bacon Broth. You certainly cannot go wrong with any of these recipes. As mentioned earlier, cappelletti are cooked in the broth in which they are served. Bring your broth to the boil over med-high heat before adding the cappelletti. Once the boil returns, reduce the heat to a soft simmer. Too hard a boil may damage the cappelletti. Actual cooking times will vary, depending upon the cappelletti’s size and whether they’re freshly made or frozen. Once the cappelletti begin to float in the broth, they are usually just about ready for serving. I’ll wait another 1 or 2 minutes before tasting one for doneness. Serve immediately with plenty of grated cheese at the table. Not everyone has the time to make homemade brodo and most of us will turn to store-bought stock occasionally. Whether you use your own broth or buy one at your local market, make sure it is low sodium. The cheeses within the cappelletti both contain salt and, if you’re not careful when preparing/selecting your brodo, your bowl of cappelletti may be too salty to enjoy. You can always add salt, should the soup need it, just prior to serving. I shared the recipe for Steak Pizzaiola about 2 years ago and, since that time, it has become one of the most popular recipes on my site. Easy to prepare, this is one dish sure to please all members of your family — well, except for the vegetarians. Not to worry. We’ll be sharing recipes for our non-carnivore friends in the weeks to come. In the meantime, you can check out the recipe for steak pizzaiola by clicking HERE. This entry was posted in Home-Made Pastas, Make It Yourself, Pasta/Rice/Soups (Primi Piatti) and tagged Cappelletti, Cooking, family recipes, Food, Italian, Pasta, Soup by ChgoJohn. Bookmark the permalink. These cappelletti are so cute! I love fresh pastas and this sounds wonderful in a homemade broth. Thanks for posting John! Thanks, Anne. These make such a great soup. They’re certainly good enough to be served for lunch on Christmas or New Year’s Day. Definitely a family favorite. John, these are amazing! My goodness, the time and talent it takes to create these is so impressive! I surely would not be able too…I’d go crazy, lol! They are just so pretty, I love pasta! This post is beautiful. So impressed with your cappelletti. Especially love the close-up shot of them all lined up, like plump little pillows ready for dunking. Thank you for sharing your memories, recipes and instructions. Have you made a book? You really should if not. Thank you for your kind words. Some of these posts write themselves. The memories are still so fresh, even after more than a couple decades. I recently spoke with a Cousin who remarked that he could still “hear” him Mom’s knife (my Zia) as she cut the pasta noodles by hand. Like him, I’ll never forget that sounds. I’ve not created book and even if I were to tackle it, I would have to wait until a few more of the Bartolini Crown Jewel recipes are written. The book would be incomplete without them. Thank you, though, for your encouraging words. Those dies are wonderful artefacts. Very beautiful and emotive of another time. Lovely post and I should add that the sturgeon looks absolutely delicious. My Great Grandmother and Grandmother and now my mother use a die like your mother’s. I have spent years trying to find one available online. I have one like yours, except I separated it and drilled out the individual molds to look like mom’s. Anyway, what my family has always done is gather around the table, adults (allowed to speak) and children (gentle spoon to the head if they talk without being asked to) and take the filling and roll thousands of tiny balls, about the size of the end of a q-tip. These balls were then used to fill the molds… dropped in place then rolled between the pasta sheets to make the Cappelletti. I have recently replaced the ball rolling part by drilling out a “Turkey Flavor Injector.” I think I used a 1/4 inc bit. I fill that with filling, and squeeze a little into each mold, and Bam – Cappelletti. Saves hours, literally. I have pictures if you are interested. I also remember making the Cappelletti by hand. It would take several adults all day to make enough for the entire family, and they were gone in a matter of hours. I just taught my 3 yr old granddaughter how to make the “little hats” by hand, and our family always makes a few dozen by hand every time we make Cappelletti, as a tip of the hat to our ancestors that gave us this rich tradition. Most of my fondest memories of the older generations of my family involve Cappelletti. It was always a treat, both in taste, and in family. I regret never having seen Mom use this dye. As a boy, I saw her make cappelletti by hand countless times but I had moved away when she found this dye — somewhere. How she hand-rolled those tiny balls of filling is beyond me. In a word – FAN-TAB-ULOUS – it’s a real word cause I made it up! Mandy: Wordsmith! If you ever quit blogging, you may wish to interview with the Oxford Dictionary people. I bet there’s a career waiting for you in the “New Words Division.” Enjoy your week, Mandy! Great post! Your raviolini look fantastic. I just made homemade minestrone last night and had some extra broth left over. I know what I want to do with that now… we’ll just have to finish eating the soup I made last night first! The single cappelletti on the spoon in a bath of brodo, just ready to be savored is a terrific photo. The soup spoon at the ready, to be lifted to the lips- the anticipation of imminent satisfaction is palpable in the frame. Once again I am in awe of what’s produced in your Bartolini Kitchens, John. The heart you put into your mother and aunt’s heirloom recipes is in every post! We readers are fortunate. Oh, Ruth. You are so good to me. Thank you for that. So many of the recipes for the ravioli-like pastas are nostalgia-inducing. The smell of the pasta dough and filling, the sound of the pastry cutter on the pasta board’s wood, and the sound of the pasta machine cranking out the dough sheets. I hear, see, or smell these things and am immediately transported back to Mom’s kitchen, watching her at work. Making these is one of those rare instances where the preparation, for me, may be even more enjoyable than actually eating the pasta. I am so glad I started on this project years ago. It has been very rewarding — and continues to be. Ooh I will stay tuned and forgot to thank you for the lovely mention. Slap on wrist, how very ill mannered I have become now that I am a “lady builder” (as a neighbour called me the other day)! We forget how hard things were in the kitchen – 5am. Your filling is really delicious. This is a recipe I will be making in the future. How we take simple things like freezers for granted today — but I can clearly see the way the freezer revolutionized cooking in your home and made the holidays more enjoyable for both your mom and Zia. 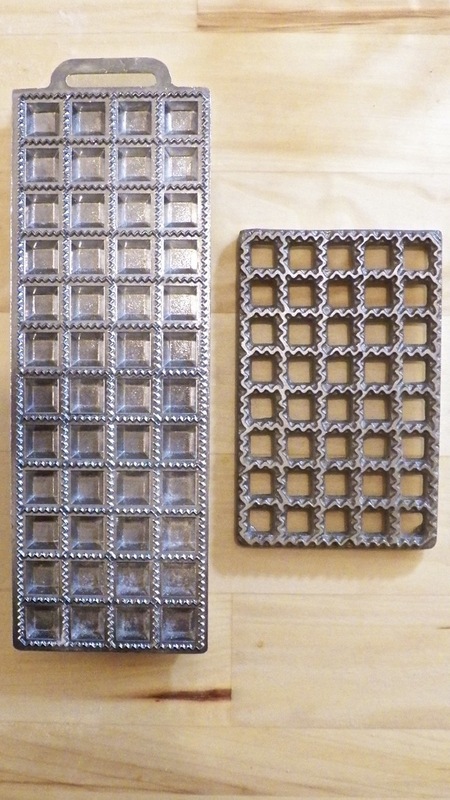 Your mom’s moulds do look like they would be hard to work with because of their size. Thanks also for the tip about using unsalted both as I don’t think I would make both of these from scratch at the same time! Thank you so much, Barb. We were quite young before the freezer was bought and just never realized the work Mom and her Sister, my Zia, went through to give us ravioli for dinner and cappelletti for lunch. It wasn’t until we were much older that we learned all that they did for us. Yes, the moulds are difficult to use but, if you’ve 2 ponytails in the house, the cappelletti are perfectly sized for their enjoyment. But do mind the salt! I learned that the hard way when I bought an off-brand of chicken stock that was heavily salted. Adding my precious, handmade cappelletti to it and that soup was practically inedible. What a disappointment but I’ll never do that again! What a fantastic recipe! I don’t know why but it makes me think of my grandmother who I was very close to, :). Wonderful! I have never attempted to make that, but a friend of mine in Brazil, son of Italians, would make capelletti in brodo every Christmas, for his whole family. I remember his recipe being also just the capelleti with the clear broth, nothing else. Perfect! Thank you, Sally, and your memory corroborates my family’s tradition. We all loved Mom’s cappelletti so much that we probably would have viewed anything in that bowl, other than broth, to be a “distraction” — and certainly not a welcome one! All these many years later, I wouldn’t dream of serving it any other way. It just wouldn’t be right. 500 cappelletti, your freezer sure is well stocked. How long did it take to make all those beautiful little pillows or you had help? Love you simple filling that I am sure is tasty with the cheese. Noticed there is no veggie in the ready-to-enjoy bowl. Do you put veggies in the soup? A time consuming process but you must have a big smile on your face now that you have 500 in your freezer. I love the idea of cooking the cappaletti in the broth they will be served with – so much extra flavour. And I’m in awe of your Mom and Zia and all the work they put in to make these feast-day treats! Thank you so much. Yes, cooking them in the broth is the only way to go and it’s the one time where you won’t mind if one or two of them split during cooking. You know, we were far too young to appreciate what those 2 women did for us every holiday. I’ve got a better idea now that I make many of these dishes but, even so, my efforts are a far cry from caring for 3 children as well as rising at 5:00 to make 500 ravioli for the holiday dinner. What I find most fascinating is that we haven’t one photo or movie of any of the women making any kind of pasta — and Uncle was an amateur photographer and taught a few of us how to develop film in his darkroom. Making pasta was so commonplace that it didn’t even warrant a picture. I’d give anything to find a picture from that time but there just aren’t any. You made 500???? How about sending some my way, please???? I’m sure I’d be tempted to overstuff each one, because I love the filling! I think it’s wonderful John that you have these memories of your mom and aunt getting up early to make pasta for the holidays and here you are now continuing to make your own pasta! I need to be better about following some of my moms traditions! One of the great things about this blog is that I feel a real connection to those good times of my youth. I can almost feel Mom’s presence when I make the pasta or in my kitchen when I cook them. I do hope you can find some time to reconnect with some of your Mom’s traditions. Take it from one who knows, Tanya. It is a very rewarding experience. Guaranteed. I can’t even imagine doing a couple of these let alone 500!!! You get the super duper gold star for this. MD, you’re gonna love these! It’s worth breaking out the machine. You’ll see. What a nice comment to leave, Debra. Thank you. I have made the “hats” but my fingers are too large to make them really small, like they must be if used in soup. Cappelletti must be no larger than bite-sized. Mom’s — and these — are even smaller so that kids can eat them without a parent’s help. If a child can handle a spoon properly, she/he can eat our cappelletti. I see my Zia’s reaction to how the family recipes are being received and how much everyone enjoys the family folklore. Mom would be every bit as thrilled. I told them both, for years, that they were great cooks but they were too modest to accept it. Now, thanks to the kindness of all of you, I’ve got proof!!! Zia will still never say it — but neither can she deny it any more, too. I need to go get some of these dies soon! I have xmas money that needs a home. I think you just gave me the inspiration I need to go spend it! I can just imagine how delicious this tastes and how great your home (and the flat) must have smelled with its preparation. And talk about dedication – getting up at 5 a.m. and cooking on a holiday morning. While I’m not planning to get up that early on a holiday morning, the thought does make me feel warm and cozy. Reminds me of grandma’s house. 🙂 Looking forward to the Sturgeon post too. I’ve seen that at the store and never buy it. Curious to see what you do with it. Have a great week John! Thanks, Kirsty. They really were something, weren’t they? As you know with your SousChefs, my parents were up half the night on Christmas Eve assembling toys and wrapping gifts. They no sooner got to bed when we woke up around 3:00 am to see what Santa brought us. We went back to bed and Mom & Zia were up an hour later to make pasta. And as kids, we were totally oblivious to it all. It wasn’t until we were adults when we realized what they did for us. And, really, it wasn’t until I started making ravioli that I fully understood their efforts — and I’m using modern conveniences to make mine. I remember my mother talking about her grandmother making kreplach. They always were remembered with such awe. You have inspired me. I now have to find a recipe for kreplach. And kreplach don’t require a mold though maybe that makes yours easier? I doubt it. Thanks for the inspiration. Food memories stick around long time. Many years ago, Mom never used a mould to make her cappelletti or ravioli. Once she got her first mould, she never went back to the old ways. Although I’ve made them without the moulds, I almost never do now and rely strictly on the moulds. I find them very easy to use and quick. I hope you do decide to make kreplach and blog about it. I’m very interested in learning an authentic recipe. Yes, food memories do last. Preparing some of these recipes will bring to mind memories that I later include in that post. If it weren’t for me preparing that dish, I probably wouldn’t have remembered them. I’ve made cappelletti the traditional way several times – and you’re correct that it’s a pain! This method makes much more sense. I’ve never had it in brodo – love the idea! Great filling, great post – thanks. THanks, John, I’m glad you enjoyed the post. Lovely mix of instruction and storytelling John. The idea of a bowl of these in broth is very, very appealing. I must leave the office now and go sit in a traffic jam to get home to roast pork belly. Tortellini in brodo happens to be one of my favorite things in the world. I could (and have) had it for breakfast. I will definitely be doing your brodo recipe and playing with those pesky “little hats.” I usually do a cheese filling – but with the not-ending-soon-enough winter, will look at the heartier meat filling. Just discovered your blog – heaven. Hello, Claudia, and welcome! We never used cheese-filled pasta in brodo. This filling was always used in soup and no other filling ever was. I bet, though, that your version was delicious! 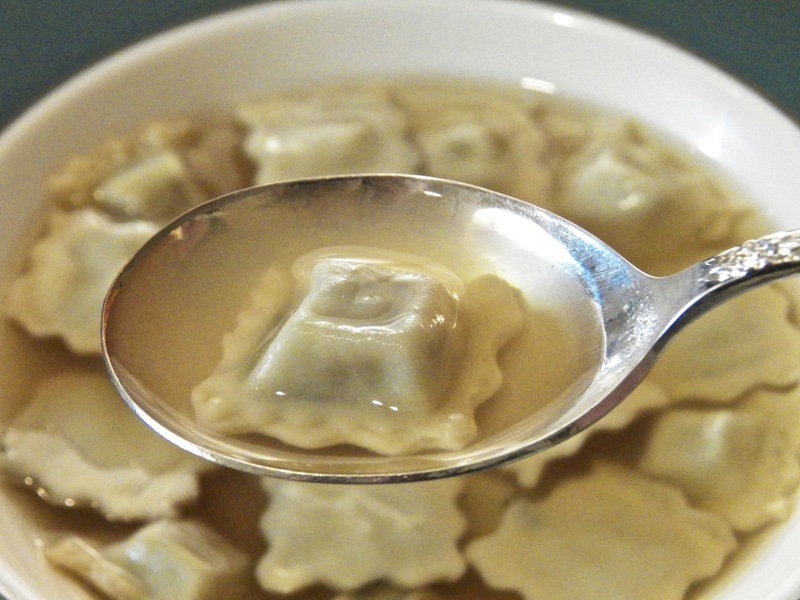 There’s just something about cappelletti/tortellini/raviolini in brodo that is so very good. It’s the perfect comfort food for this time of year, isn’t it? I just love that you have your dear Mom’s cappelletti die, that is just so cool. It’s really unfortunate that you don’t have a recollection of seeing your Mom working with the die, but I bet there are a few YouTubes out there about something similar! I don’t know what we did without the internet; I literally look something up at least 5 times a day. I can certainly get into this soup John, it looks absolutely scrumptious. And I do adore when a combination of meat are used, my dear Mom used to combine pork and veal all the time. Of all the soups Mom made, this was my favorite. She only used her soup tureen for cappelletti and that was served only on very special occasions. The soup and memories are one-of-a-kind. We’ve finally had some snow over the past few days. I’ve actually used my snow blower once and shoveled twice. After midnight, it’s supposed to start snowing, then turn to sleet, then freezing, and turn to rain at dawn. Later in the afternoon, the rain will turn to snow. In short, we’re going to have a mess of a day tomorrow. I think I’ll postpone running my errands until Friday. I hope your day is better. Have a great weekend! We’re also in for a big dump, 10-12 inches! Wish I didn’t have to work tomorrow but we’ve got a couple of client concepts due. I’ve been watching the weather forecasts. We’re relatively lucky. They’re calling for as much as 2 feet of snow is some sections out East. I hope you’re spared the worst of this storm. Good luck! Thanks John, you too. I’m planning on curling up in front of the fire with a big glass of wine! You are making me hungry, John: I love tortellini in brodo and would surely like cappelletti. I am hungry John!!!! for one of those bowl of true pleasure! 🙂 I’ve learned the hard way how much filling to put in the ravioli die: my first was a complete disaster. My mother makes those little hats by hands, and they are so tiny! I can never get how she does is, and I watched her many times, and even helped her, well, tried to help as my filling is all over the place, but not in the tiny little square. 🙂 We make ours a bit larger, about 3 cm, quicker and easier to hold in your hands. I applaud your Mother for making all of those little hats, Marina. I just cannot do it. Not only are my fingers too large but I just don’t have the skill. My die is perfect for me. And yes, I’ve had a big mess when I over-stuffed the dies. It can be so frustrating! As I mentioned in the post, I saw a vido of a woman in Bologna making cappelletti for a shop. She was going so quickly and had made so many. I was very impressed. I’ll never make enough to even come close to her level of expertise. I forgot to ask you about the sturgeon, but I guess I’ll have to wait for the post. No, I can’t wait: where did you buy sturgeon? I love this fish, it’s a king of all fish! Right here at my fishmonger. Best of all, it was on sale that day. Surely, Neptune was smiling upon me! Indeed! I haven’t had sturgeon in a very long time, since we moved from Seattle. I miss good fish. Cappelletti or raviolini…whatever you call them they look so good, and with that brodo, well, I’m sure that’s one terrifically flavorful soup. And these do look like fun to make with those cool dies, although I have to say I admire your patience in making 500 of them! Really? 500 of anything…wow, that’s amazing dedication to one’s craft, and a craft it is. I’ll bet you can taste the care, the craft, the ingredients and the steps in every spoonful. Your mama raised you right! 🙂 Thanks for sharing. Another great post, John! Your raviolini in brodo look absolutely delicious. I am curious to try your filling with lemon zest. I have used lemon zest before in pasta stuffing with fish, but not yet with meat. Your family seems to have a thing with cream cheese. Think I might stick with ricotta, although I should probably try cream cheese at least once. Thanks for the mention, and I feel so honored to be called your blogging buddy! I’ve spoken with Zia about our using ricotta sparingly. Both she and Mom didn’t especially care for ricotta in their lasagna and they felt the same about using it in ravioli. Cream cheese was a better binder, in their opinion. I like that by using cream cheese, their dishes are unlike almost all others. Thanks, Stefan, for leaving such a nice compliment and comment. Perhaps “delighted” would have been a better word. Sometimes I forget that English is not my native language and I just type the first word that comes to mind, rather than thinking it over a bit more. Wow, it all looks so yummy! You have me wanting to make these this weekend! A feast for the eyes! and now I am hungry!! If you ever get the time, this is one of the best soups you’ll ever make. It truly is that special. A beautiful simple family recipe oh not so simple to do! Thank you for taking the time not only to make the cappeletti but to share the wonderful family story at such length: every word has been enjoyed and will be reread! Also have to delve into your pizzaiola recipe: I have made the sauce many times but usually used it as ‘dressing’ on quickly grilled steaks or chicken fillets. 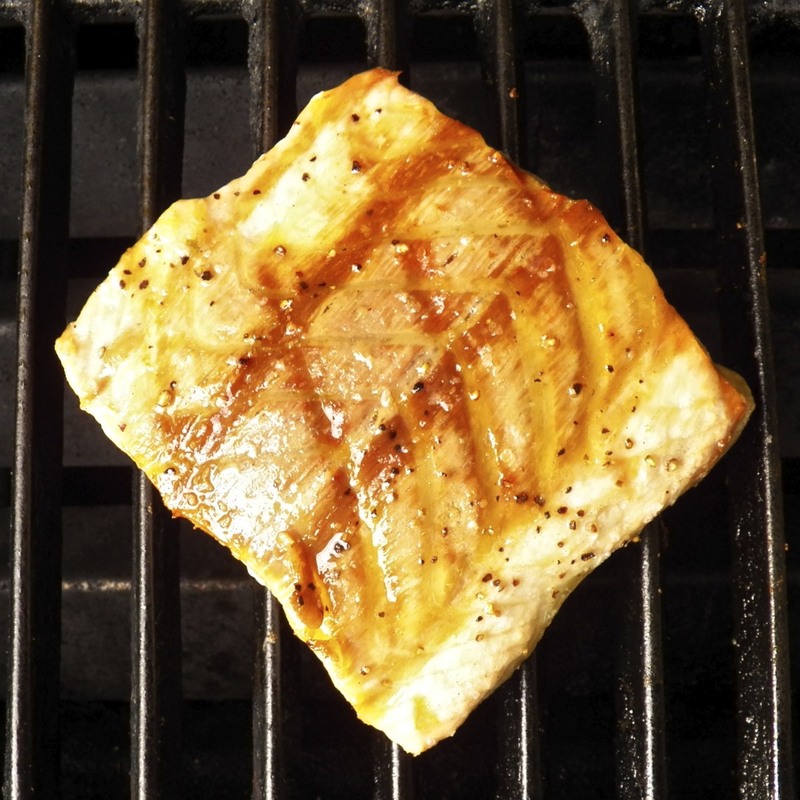 And am looking forward to your grilled sturgeon also even if my fish will have to be a substitution! What a lovely wealth of recipes 🙂 ! Et tu, Eha? Making these tasty little pillows is not as difficult as you would think. With very little practice you’ll be making them like a pro .. ok… like a Bartolini. I just might have to take my ravioli dies on a world tour, teaching friends far and wide the joys of making ravioli and cappelletti. I wonder if I can bring them on the plane in my carry on? Beautiful guy: nothing whatsoever ‘Brutus’ish anywhere . . . Methinks some airlines would be simpatico!!!! 😀 ! Does it still come here? 😀 ! The sturgeon recipe is eagerly awaited in the Southern Hemisphere! Thank you so much, Judy. You’re, once again, so complimentary and I’m grateful. Thank you John! I am leaving these precious goodies to the Master Chef…, you!! I don’t remember telling you that, Barb, but cappelletti is said to resemble the Pope’s hat. I wish I had thought to make a couple in the traditional shape just so that everyone could see them. It’s a little late now, I guess. You gave me a chuckle with the comment about going back to the top to check spelling. With some of these pastas, like cappelletti, I copy the name and paste it whenever needed. Sure does cut down on the misspellings. That first photo is a work of art… followed by the story of Bartolini cappelletti and ravioli… and the recipe. It’s incredible the amount of work that went into food, and from the consumers’ point of view wonderful. A gain – in time – that food is now able to be pre-prepared and stored, but also a loss. Thank you for always taking the time to fully explain your recipes. For example, even though I’ve never I’ve attempted either cappelletti or ravioli I think I could do a reasonable job with your instructions. Favourite Husband is looking forward to the Grilled Sturgeon recipe. Oh, no. Thank you. I try to write these posts to teach the young ones in the Bartolini Clan, the ones who never saw their Grandma or Great-Grandma prepare these dishes. The instructions must be thorough yet easy to follow if any of them are to ever attempt to follow any of these recipes. Your comment is music to my ears and I sincerely thank you. It wasn’t until I was well-grown that I realized just what those 2 women did for us each and every holiday. As if that wasn’t enough, we often had dinner guests, too. So, they made pasta for all of us, fed us lunch, and then prepared for dinner guests. I don’t think they actually had a holiday until that freezer was bought. I don’t know how they did it. Thanks, MJ. This really isn’t as hard as everyone seems to think. Repetitive? Yes, but not at all difficult or involved. You’d be surprised. Now, try and fold them by hand to make little hats, and, well, I’d throw in the towel. I’ll never be able to do that! My mother cooks them for Christmas Day lunch. I do not think that the Super Bowl is an occasion big enough for this masterpiece maybe because I have never seen one and I have no intention to start anytime soon. I’ll rather say that your is an academy award dinner dish. 😉 They must taste wonderful. A gustatory bliss! Thanks for sharing all these delicious, priceless recipes. I am hungry now….have a great weekend. One of the best things about creating this blog is that I can make all of these old family dishes without waiting for a special occasion or holiday. I’ve never eaten so well! You, too, have a great weekend! The entire time I was reading this I was imagining myself sitting at your family table for Christmas dinner and New Year’s dinner! What a slice of heaven that would be! We take so many things for granted, like the convenience of a large freezer! There were many holidays (pretty much all of them) where my mom and grandma were up at the crack of dawn cooking, I’ve done it myself. It can be exhausting and the addition of any modern convenience for large family gatherings is always a relief! Thanks, April. It really is amazing to think of what the prior generations did to make sure our holidays were special. Something like a freezer made such a big difference for them. I’d like to think that I would have done it but, to tell the truth, I’m not so sure I would have. Well if the new recipes for pasta dough work out, I would be happy to mail you a batch of frozen ravioli for your cousin. Right now we’re waiting for Winter Storm Nemo to hit us, so it will be a while before I’m able to start experimenting with the dough. 5:45 am and it just started snowing. Another wonderful food memory. Piping hot broth, soft delicate pillows. Sigh…. Thanks, Dave. This is one of Mom’s best dishes. This looks perfect and delicious. The wonderful things I learn on your wonderful blog. I know many make ravioli “free-style” and don’t use equipment of any kind. Cappelletti, though, are quite small and it would take forever to make enough to fill a tureen of broth. This dye makes 48 at a time. It is so much quicker, at least for me, to use a die. I’m more than happy to help should you decide to shop for ravioli dies. I’ve got a great source — and I’m not affiliated with them — for virtually any kind of ravioli making equipment. I’ll gladly send the link, if you like. Oh please send me the link. I’ll take a look at it and see what they have. I love to make homemade ravioli but it’s time consuming so I don’t do it very often. Done! If you do not receive my email, let me know and I’ll send the info using a different email account. Happy shopping! What an interesting post John. You always make these things sound easy but I think you must have incredible patience (and obviously skill). I never realized that you rolled out sheets of dough then put the piles of filling before cutting but I guess that’s a whole lot easier than cutting each & pinching each one as you go. I’m almost afraid to show this to my husband because he’s definitely going to want these – like probably in the next couple of days! In the meantime I’m gearing up to make some noodles for some homemade chicken soup I’ve got brewing. Thanks, Diane. The method you described — cutting and pinching each one — is great and many people follow it. For me, these cappelletti are too small and too many are needed for a family meal to use that method. I’ve tried 2 other ravioli making attachments, as well as the method you described, and these dies are still the best for me. I bet your soup with your homemade noodles will be incredible! And its timing couldn’t be better. I hope you guys don’t get slammed too badly tonight and tomorrow by these storms. Good luck! Isn’t is amazing how your Mom and Zia would do all that work! Getting up at 5am to prepare for the holiday meal! My sister and I think about how my mom prepared so much food for the holidays and we barely make half as much and are wiped out!! It also amazes me at your making your own pasta; it just seems soo time consuming, yet I read your post and you make it sound so effortless!! My store bought tortellini and ravioli just cannot compare to yours. Maybe one day I’ll start seeing a Bartolini Pasta in my markets…. :) you just never know!! Thanks for the mention John!! Time-consuming?! Oh my goodness. Steve always jokes that ravioli is the reason that Italians have large families—you need a lot of helpers to make enough for a holiday feast! (His poor mom was all alone here in KY making them after they moved from NJ.) Your cappelletti provide support to that argument and look just wonderful. I so love filled pastas in broth. Hi, John. I always love to see your pasta posts. The pasta always looks so beautiful, plump and delicious. I also realize the time involved in the technique. As always, very impressive post and I love the family stories. Thanks, Richard. With your skill in the kitchen, I bet you’d master ravioli making in no time. 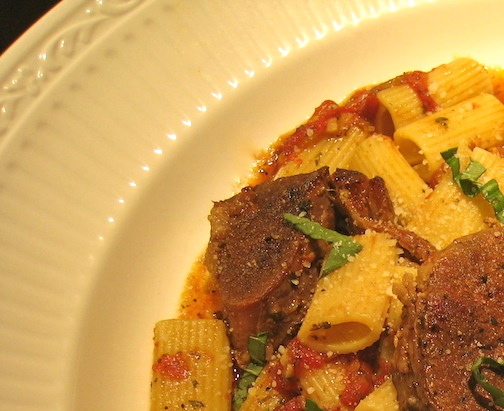 These pasta recipes all come with so many family memories for me and all of my generation. Oftentimes, the memories will surface as I write the recipe and I doubt I could write one without the other. These pillow-y goodness are beautiful. I need to get one of these mold! 🙂 I know it takes time to make them perfect but I think it’s still easier than doing it free-hand! I agree that using the dies are easier than going free-hand, especially when making little “pillows” like these. Still, there is a learning curve but not so bad that you cannot learn to use the die quickly. You’ll see. You’ll be enjoying a cappelletti-laden soup in no time! They sound delightful and in a brodo sound delicious! Having been living in a smal apartment with only a small fridge with an ice box, I readily understand what a difference it makes to have a freezer, and your mum and aunts really did deserve a rest on holidays. It really brings home what holiday/celebration food is all about. Well, getting out the snowblower was a colossal waste of time! Because of the frozen rain, everything is covered in a thick coat of ice. Luckily, it is an uneven surface so people can get traction and won’t fall. Still, I need to get back out there and clear it. I’ll do that after I get back from the Italian market. I need a cannoli! Yes, you can use 2 sheets of dough to make these. We usually make them small enough to fit on a soup spoon and you may find it difficult to make them that small with the 2-sheet method — but it can be done. 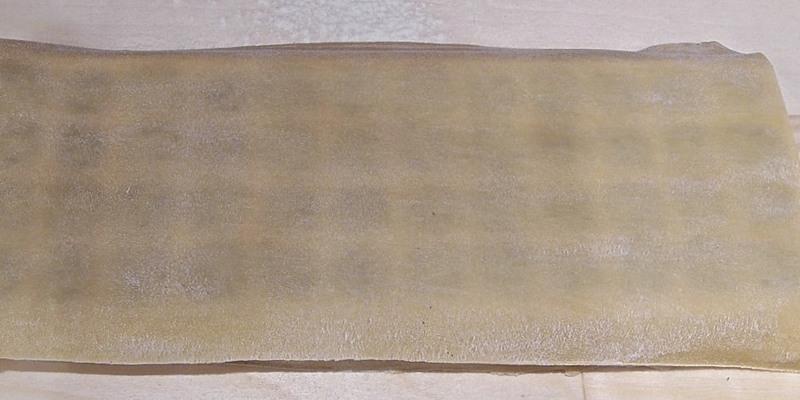 Here’s Caroline’s post showing how she uses 2 sheets to make ravioli. 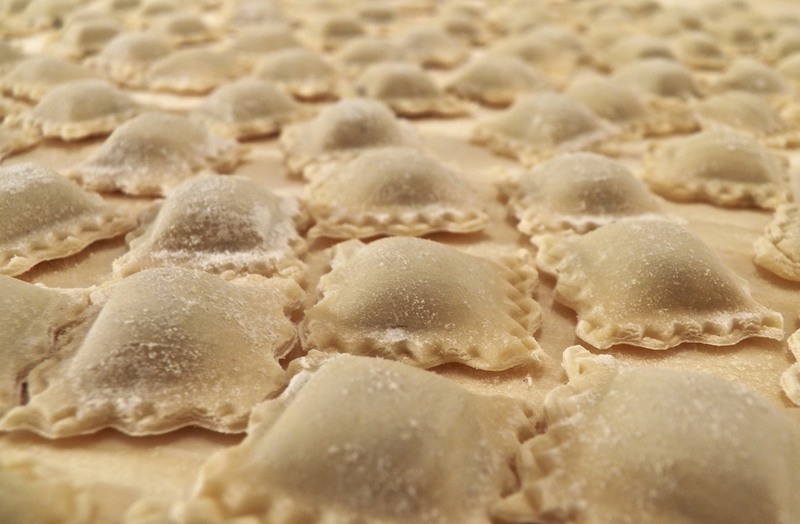 And here’s Greg’s post in which he makes ravioli in a way similarly to what you want to try. Both examples, though, make ravioli that are quite large and if you made your cappelletti that large, a diner would have to cut them before eating. Much of the filling would spill into the broth, as a result. This brings back so many great memories of my childhood – going to my Italian neighbors once each year when they worked for 3 days straight (4 people working) to make pasta like this (and sauce). I was fascinated. My reward for my enthusiasm was always a batch to take home. Oh, how we savored that meal! Unfortunately, I never asked the Rizzos for their recipe, but I’m betting this one comes very close. It is on my list of things to make (if I can ever find the time). It was really something to see, wasn’t it? Do you know that we haven’t one picture or home movie of anyone making any kind of pasta? It was just such a common thing, like dusting or washing dishes. Who ever would waste film on such a thing? I’ve spoken with family members and what we wouldn’t give for even 1 photo. If ever you do decide to make these or something similar, I’ll be here to answer any questions that you may have. The sturgeon is this Wednesday’s recipe and I hope you like it. This is such a amazing and creative recipe ! Thank you for visiting and taking the time to leave so nice a compliment. You’re very welcome. My local trattoria could serve this every day and I’d still want more. Probably has to do with the fact that, although we all loved it, Mom only served it on very special occasions. Now, seeing soup with cappelletti in it is still an unparalleled treat. Thank you, Glenda, but it’s not as hard as you may think. Remember, my die makes 48 at a time. Because I started late on the first day, I made them all in 2 sittings. All told, It took me about 4 hours from start to finish. Next time, I’m sure it will take me less time. Once you get going, things move quickly, especially since I use an attachment to my stand mixer to roll the dough. At one time, that was the most time consuming part of the process. There is really nothing to say my friend except that I’m hungry and these have to be on the menu whenever our gluttonous feast takes place. Pillows of perfection. I love how those turn out and the precision that goes into each pocket. Love those molds too. I so appreciate how clear and instructional your posts are, John. I know that if I follow your guidance I too can make wonderful dishes like these adorable cappelletti. Honestly, I just said “ahhh” when I saw that last photo of them looking all plump and sweetly crimped. Never thought I’d get all sappy about pasta! I really do hope anyone who reads these posts realizes that these pastas can be made at home. Broken down into easy-to-follow steps they are a snap to make. As I’ve told others: call a friend, open a bottle of wine, and have some fun. Ravioli always feels like such a treat and your detailed post about the preparation of these soft little dumplings attests exactly as to why they are! That was a nice thing to write. Thanks for dropping in and for leaving such a nice compliment. Your ravioli looks so cute! 🙂 These are made with the smallest die that I can use and are perfect for soup. Thanks for taking the time to visit these posts. O M G – this looks sooo delicious. I was thinking, “How come I hadn’t seen this recipe before?” I now realize I hadn’t “discovered” your amazing blog one month/two weeks ago. How did I live without you John??!! Almost a year ago I came across this very post – I ‘fell in love with your blog”. In honor of that – here’s another of my ‘trivia thingies’. Thanks John – hope all is well with you my friend! (I’m either ‘A Font of Knowledge’ … or… I’m Full of Shite’, as the Irish say! And thank for taking time to reply – after all it is ‘our anniversary’. And now I can’t imagine life with my John! I agree, This is one great bowl of soup. I happen to be looking for additional molds and happened upon your blog. Loved reading it! My in-laws have a Cappelletti dinner every year around Christmas. In fact, we made them last night! Hope you have a wonderful holiday! I do not know whether you’re aware but Fantes.com has plenty of pasta-making equipment, from pasta machines to ravioli molds to corzetti stamps. I am not affiliated with them in any way but do buy much of my pasta equipment from them.